Welp my friend. It’s over. 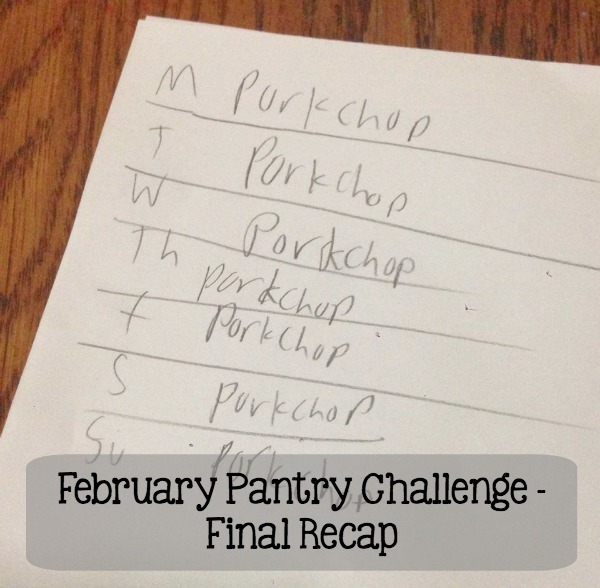 Our month long “pantry challenge” is over and I couldn’t be happier to have barely made it. Prior to the start of this week, we had used up our “2 meals out” quota for the month. We had a bit of a nutty schedule on Wednesday, with an early dismissal school pick up and about 35 minute window before heading back to the school for the older boys’ teacher conferences. It would take me 10 minutes to get home and 10 minutes to get back to the school. Plus the extra 5 minutes on both ends for actually getting unloaded from the car, and another 5 (sometimes 10!) to get back into the car. It didn’t make much sense to go home. Given the short time window and the potential for an “unload and reload crisis” AND the fact that I had not eaten lunch yet, I thought it best to grab food from the drive through. I’m totally not going to beat myself up over this one, because it’s really a matter of sanity…partly poor planning on my part…but life happens, so I ‘broke’ my challenge…and I’m okay with that! The freezer in the garage is defrosted, cleaned and ready to be refilled! On Tuesday, I moved what was left in the garage freezer into the fridge freezer, unplugged it and let it defrost. I gave it a good wipe down, and it’s ready for more freezer goodies. I went over my self-imposed weekly budget of $30 the 3rd and 4th week. While this doesn’t surprise me that it was a bit over in the final two weeks, I’m still very pleased with the spending results. Fell in love with oatmeal all over again. BBQ Chicken on hot dog buns. When I was going through what was left in the stand up freezer in the garage, I came across some BBQ chicken and a bag of hot dog buns and decided together they would make for a great dinner. While it was strange eating shredded chicken on a hot dog bun, it tasted just as if they were on a regular bun. Basically, “sloppy janes” on rectangle bun vs. circle bun. While I’m not going to go crazy tight on our budget this week like I’ve been doing this past month, I do plan on eating from the freezer and pantry just for dinners for one more week! For this week’s shopping trip, I do need to restock on some ingredients that we ran out of…like ketchup, Parmesan cheese, chips and snacks, etc. Someone commented about how they would be worried about spending a ton of money on groceries the first week back from the challenge. My hope is that I’ll spend a few more dollars than normal, and slowly begin to restock on the items we need. And with my freezer now wiped out from all the freezer meals I’ve prepared over the past few months, I better get to work on the next set of recipes for plan #8! And the following week is our boys’s spring break, so we’ll have a little extra free time and flexibility in our schedule. We’ve decided that week my oldest son will be responsible for planning, shopping & cooking 7 meals that week (mostly dinners!) I’m really looking forward to having a little extra help in the kitchen and teaching him some fun planning and cooking tips! More fun and adventures to come in our kitchen! While I’m a little nutty and went for a month long pantry challenge, I really, really, really would encourage you to take a few minutes to look through your pantry and freezer and try to come up with a week’s worth of meals and do a week-long pantry challenge. If you do, please let me know about it…on Twitter or Instagram and use the hashtag #5dollardinners! Also, feel free to check out the free printable downloads that I have available for pantry staples recipes & other menu planners! I love seeing the results, fabulous job! We are hoping to spend $200 on food for the month of March. It’s just my husband and myself, but we eat a lot of fresh, organic food items, and I am also a newbie prepper, so our grocery bill tends to be quite high. But I have been stocking our freezer for the last three months, so that will allow us to eat mostly from our current stock and save significantly for March, thus a pantry challenge for us! We did Survival Month as well! But lost focus, shopped needlessly, later in the month. Early on it helped to say out loud and really eliminate going out as an option. We DO have “survival week” once a month-for the same purpose, ear what we have, not waste leftovers/freezer ingredients. So we will be keeping this up! We are doing the challenge for March. Will be interesting. Kinda nervous. But we can do it. Made my menu today.